Author: Werner Vycichl †. Edited by: Dymitr Ibriszimow, Maarten Kossmann. With an introduction by: Lionel Galand †. Series edited by: Harry Stroomer. 36 pp. Roman, 258 pp. Werner Vycichl (1909–1999) was among the foremost specialists in Berber historical linguistics. Taking a broad comparative view, his studies of Berber historical phonetics and morphology incited much interest and often provided fertile ground for discussions. Among the largest projects he envisaged was a Handbuch der Berbersprachen, an overview of Berber historical linguistics, phonetics and morphology. Although he worked on this for over twenty-five years, he was not able to finish it. The first part of this edition is an extract of his manuscript. It contains article-like chapters dealing mainly with Berber language materials in antique sources, historical phonetics and morphology of the Berber languages. 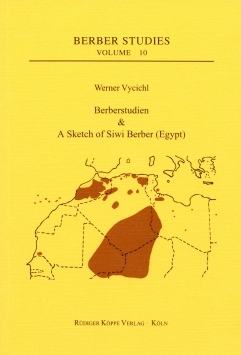 The second part of this volume is a hitherto unpublished sketch of the Berber language of Siwa (Egypt). Based on fieldwork undertaken over many years, it provides us with a full overview of Siwan morphology, as well as with important insights into its phonology and syntax. Following the link at the bottom, you will find the biography of Werner Vycichl. We will have to use this edited collection together with original, earlier published versions in order to compare them and to reconstruct the evolution of Vycichl's brave ideas. Only then we will be able to do justice to this exceptional scholar. It is good that at least a part of his unpublished papers has been made accessible to everybody.